Samara has always been a popular destination for tourists who travel to Russia. A large number of interesting attractions may be found there and some of the architectural sites that refer to several centuries back to the past. 2018 FIFA World Cup, which will happen this summer in Russia will include Samara in the number of cities that will host several football matches. The events are highly anticipated by the world press and by the football fans who are planning to visit the cities in order to support their national teams. The most frequent question many people will be asking around is how to commute around Samara during the championship? Particularly, if we are speaking about a large group of people. 8rental has found a perfect solution. All that has to be done is to rent a coach for the whole duration of staying. In order to get rid of various stressful situations related to traveling to an unknown city, we advise you to book one of our modern coaches with a driver right now. Get a quote and just wait for the time of your arrival in Samara. It is our duty to make sure that the parties who intend to rent a vehicle, such as a coach via services of our company get the best transport and quality driver possible. We have an outstanding relationship with many leasing companies and franchises as well as financial institutions that allow as to rent the best coaches and supply them for rent to our clients at any time. Our friendly staff is ready to offer help 24/7. Our company believes in lifetime customers and not just one ride type. We approach each request individually as we consider that our customers deserve the best car rental and chauffeur services. 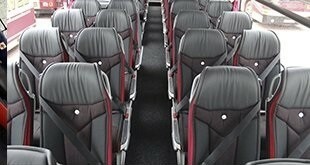 Customers will get the buses from brands such as Scania, Van Hool, MAN etc. If our clients wish to consider a means of transport that has a prestige badge on it and accepted as a VIP coach such as Mercedes or Neoplan, we can also make an offer for you by sending us a request in advance. We want to assure you that the coaches for hire totally comply with all European safety regulation and provides users with all commonly used features that make traveling comfortably. Every rented coach is equipped with climate control, air conditioner, stations for making coffee and tea, it has TV along with the corridor between the seats and a WC onboard. The coaches may also be equipped with Wi-Fi systems. The VIP transport can give travelers more comfort and sitting room. Our drivers are carefully selected for the job. All of them have experience of passengers driving including for long distances. These people are exceptional professionals who can deal not only with day to day situations but also with unexpected circumstances which could happen during the journey. They will help travelers with handling their luggage at the time of arrival at the train station, airport or river port. They will also help with the luggage when it should be unloaded at the time of arrival to a hotel and at the time of departure. Drivers speak English and maybe a few other languages, so they can help you with general questions of giving directions such as where to get a quick meal or where to buy souvenirs. Rent a coach in Samara during 2018 FIFA World Cup - an extra bonus. It does not matter whether you need a coach for a private group trip to Samara for the 2018 FIFA World Cup or you are an agent who organizes these type of trips for others. Our company’s services are equal for any type of customers and we will make sure everyone gets the same high quality service. For example, there could be groups of journalists that may need to be driven around the city and from a stadium to hotels or press centers. TV broadcaster teams and organized blogger groups who will make a substantial saving if they require our company services. 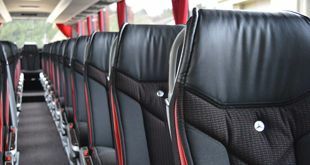 By renting a coach using our coach hire and chauffeur services we guarantee a high-class travel experience and total fun during the championship. Most of our clients prefer to contact us via telephone. This is probably the easiest and most effective way of doing things. During a telephone conversation with our representative, it is easier to explain the needs and specify the dates. The size, specification, and the coach features can also be discussed over the telephone conversation. Our employee will not only answer all your questions but will give you a comprehensive advice with regards to local specialties.Once all the queries are answered and an agreement is established, all you need to do is to make a deposit payment in order to book the service. As soon as it is received, we will be able to send you an official confirmation that will also be helpful for visa arrangements, in case you have not purchased the tickets for the championship are not purchased yet. Let us take you wherever you need to be so that you could feel your spirit free! 8rental cares for your safety and stress-free trips.